2018 was another busy year for the club and 2019 is turning out to be just the same. Lots of good tennis was played socially throughout the year and the club achieved very good results in the men's, ladies and junior matches. The finals of the club tournament and a lovely buffet lunch provided by the club's President, Wendy Evans, was enjoyed by all participants and spectators on the day. 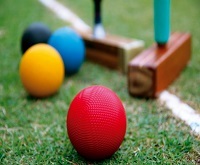 The croquet club, situated just behind the tennis club, is still going from strength to strength and now has over 70 members. Click here to see the fabulous lawns and for further information on how to join the club. The annual trip to Ashbury was again brilliant fun and the mixed open tournament organised for the first time this year was a great success and will take place again this year on August Bank Holiday Sunday. Watch this space for more details. St Agnes Carnival took place in August this year and was a great event. After weeks of work on the float, and lots of laughs and banter along the way, everyone involved was delighted to lift the trophy for the most humorous float. We even managed to nail the dance routine for the first time ever! Check out the photos in the Gallery to see what we got up to! Anyone is welcome to take part and/or help to prepare the float so look out for posters next year to get involved. The tennis club AGM took place at the clubhouse in February and subscriptions are due by 1 April. Please register with ClubSpark to renew membership or to join the club. Alternatively download and complete an application form , return it to the club with your subs and a committee member will register you with ClubSpark. 25 - 28 April 2019 - Ashbury Manor Sporting weekend. Just under 30 members are all set to travel up the A30 to Ashbury Manor in Okehampton to take part in a sporting weekend again. It should be a non-stop, 3 day sporting marathon and a lot of fun. The trip is an annual event so watch out for posters in the clubhouse if you want to put your name down for next year. On 24th March eleven club members represented St.Agnes Tennis Club at the Open Veteran Mixed Doubles tournament held at Penzance Tennis Club. As always it was a glorious sunny day and a fun tournament to be a part of. At the end of the day St. Agnes (Ian and Mandy) ended up as runners up in the 110+ age catergory. The annual dinner took place this year in the club house. The buffet provided by Anne Curtis was delicious and the evening was enjoyed by almost 40 members. Summer league will be starting again soon at the beginning of May. Please come and support our five men's and four ladies' teams. The club now has its own Facebook page. Click on the link below to check it out.